3. What's the advantage of your products9 A: 11 years of experience in production and sales,with independent brand complete variety of products of repair industry. 4. Are you accept OEM order9 Yes, of course, but we have quantity requirement, please feel free to contact our staff for details. 5. What about delivery day9 For sample with existing products, delivery within 3 days; and for customer order products in great quantity, 7 to 15 days. 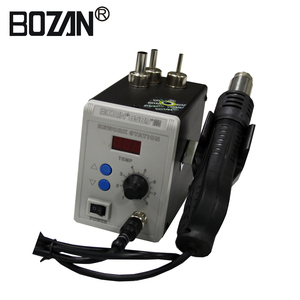 Suitable for heating shrink, drying, lacquer removal, viscidity removal, ice-out, pre-heating and glue soldering. 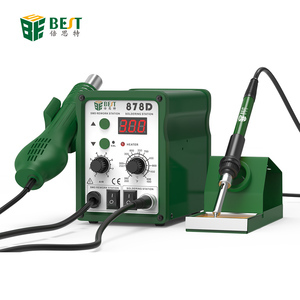 Features 1.Compact design,light weight soldering iron and hot air blower meet various soldering demands and remove kinds of chips in repair work. 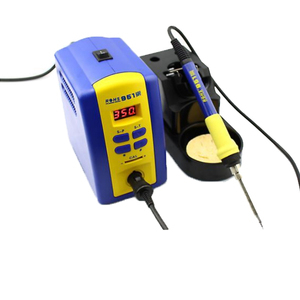 china QQ:2552751004 We are looking forward to your inquiry about lead free soldering station or other products! 1 YRS Guangzhou ZC Electronics Co., Ltd.
1 YRS Dongguan Shenwu Electronic Technology Co., Ltd.
2.then will packed by the pearl cotton in front and back of the goods. For the large goods,we will discuss with you and suggest that shipping by sea. Q:Could i get one sample for test9 A:Yes,we can send sample to you. 3 YRS Chengdu RJX Hobby Co., Ltd.
(4) Flexible arms each with alligator clips tips for the ultimate heat resistance. 5. Is it OK to print my logo on the products or packaging9 Yes. Please inform us formally before our production and confirm the design and details. We always offer the high quality and competitive products to our customers and enjoy very good reputation. We have 100 factory workers and 10 of them are quality control and engineer guys. We always offer the high quality level products for buyers and discount is available from us when the order is big. There will be more and more offices to make sure that you have both the best products and the best after-sale service from us. 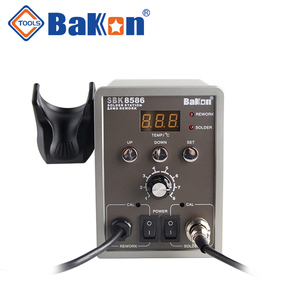 We are largest BGA rework station manufacturer in China and the machines sold all over the world. We understand you might worry the risk that buying the machine you never see from a company you never visit! Both parts have its individual temperature control with high precision temperature control panel which has 8 levels of temperature adjustments and can save up to 10 sets of temperature settings simultaneously. External temperature sensor enables temperature monitoring and accurate analysis of real time temperature profile. 6. 8 segment temperature up (down) + 8 segment constant temperature control 7. Before the completion of uninstalling or welding, voice reminder / warning to get the workers prepared. 3 YRS QUICK Intelligent Equipment Co., Ltd.
7.an automatic cooling system can prolong the lifetime of heating element and protect the handle. As it dis in the past,QUICK Soldering will continue to offer customers an sll-round support in future. If you are caught in some problems when using our products, welcome to contact us at any time. 5 YRS Shenzhen Wisdomshow Technology Co., Ltd.
6. When the temperature is less than 70&deg;c, can stop rotation automatically. 3. Indicate light is blue means gun display state indication. 4. Indicate light is red means iron display state indication. 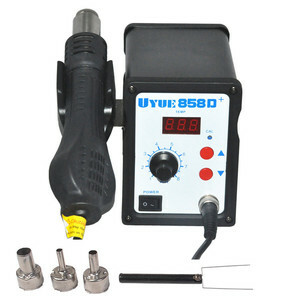 2 YRS Guangzhou MaYuan Electronic Technology Co., Ltd.
Alibaba.com offers 6,293 soldering station hot air products. About 74% of these are other welding equipment, 4% are electric soldering irons. 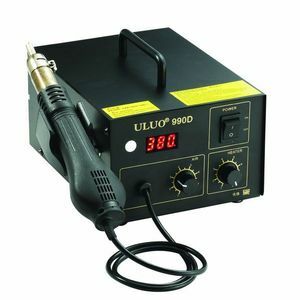 A wide variety of soldering station hot air options are available to you, such as free samples, paid samples. 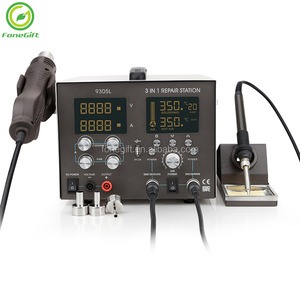 There are 6,293 soldering station hot air suppliers, mainly located in Asia. 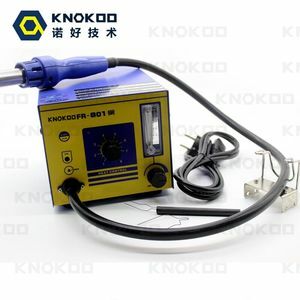 The top supplying country is China (Mainland), which supply 100% of soldering station hot air respectively. 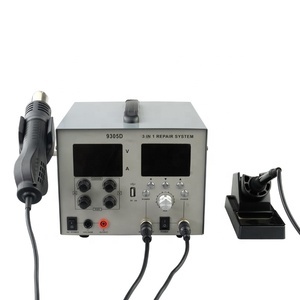 Soldering station hot air products are most popular in North America, South America, and Domestic Market. You can ensure product safety by selecting from certified suppliers, including 3,260 with ISO9001, 483 with ISO14001, and 71 with Other certification.